One runner learned hip and glute pain isn't something to put on the back burner. Last summer, I spent a very long time “frolicking” in sometimes knee-deep mud in the middle of the Finger Lakes National Forest in Hector NY. This was the Finger Lakes 50s 50k and I was excited to be back Upstate New York, where I would hang with old trail friends, make new ones, and after the race, relax in my camp chair next to my tent, spent and content drinking a local Ithaca brew. I did exactly that, only the frolick was more like fighting with the mud, stopping and starting, pulling my feet up from wet, thick mud, and then sinking them again. I repeated this process thousands of times. Pulling and sinking, pulling and sinking. I spent the entirety of the second loop wondering why I hadn’t stopped right after the first like many others had done. I finished, muddy and happy. I slept an incredible nine hours in my comfy tent, and woke up the next morning sore but refreshed. Three days later, I woke up on my parents’ couch with a weird, sharp pain in my right groin and glute that affected my stride so much that I had to swing my left leg outward to avoid it. I limped along for a couple of days until it went away, wondering what it could be…I hadn’t fallen or twisted anything, nor had I done anything that I could remember that had been particularly painful in the preceding days. The pain came and went, appearing randomly and acutely some days. Other days, I felt completely normal. Eventually I saw my doctor, who could tell almost immediately that this pain didn’t have a muscular root—it was likely a nerve issue. How about an MRI? Nope. Who has an extra thousand bucks lying around to be placed in a tightly enclosed space? Not me. Hello claustrophobia. So do you think I did anything else, like the physical therapy she recommended I do twice a week? Nope. 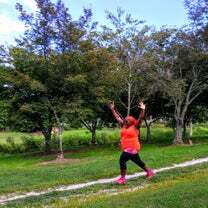 I decided to wait it out: run when I didn’t have pain, strength train and do other things when the pain showed itself. Not the best plan in foresight (I know better!) or in hindsight (I knew better!). A schedule chock full of teaching, coaching, writing, mothering, etc. pushed getting physical therapy to the back burner (another dumb decision) and I continued to train, do events, and even added Tough Mudders to my menu of preferred activities, all while my condition worsened, but not enough to stop me in my tracks. Enter NY Custom PT and Performance Center this summer, who invited me to come and check out their awesome facility in Midtown Manhattan. They focus pretty heavily on runners, and are very knowledgeable about not only about the physiology and mechanics of the sport, but of training and strengthening specifically for longevity and injury prevention. I opted for a gait analysis, or more specifically, a Biomechanical Running Analysis so that maybe I’d get some answers about my groin and glute. WHOA! Who’d a thunk? 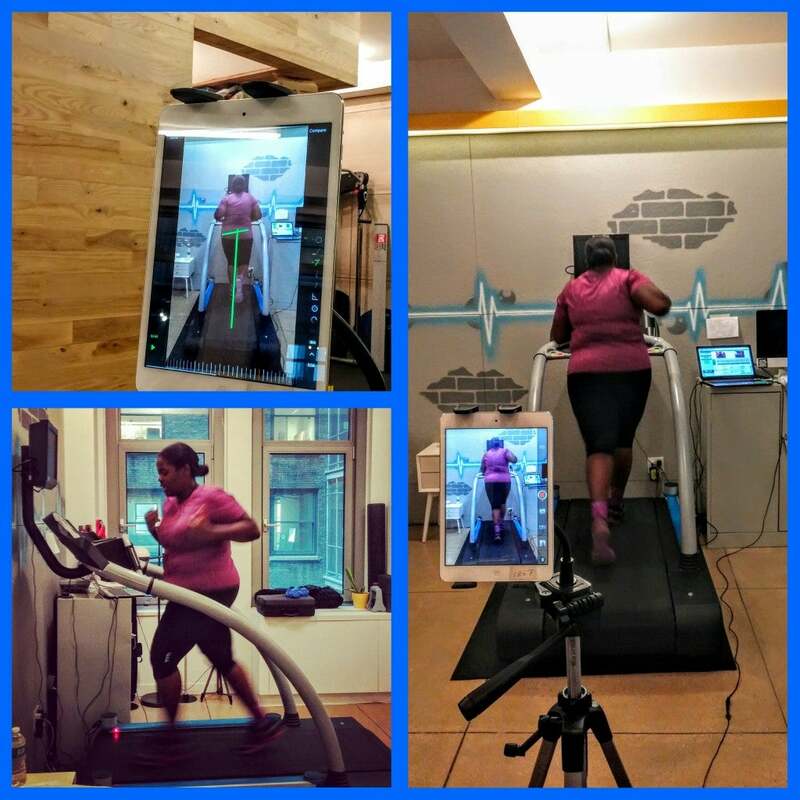 I spent a few minutes on the treadmill while the Optigait system tracked my foot size, stride-length and gait. A camera focused on my back, while another camera was perched at my side so that Kathleen Leninger, the amazing DPT with whom I had the honor to work, could get a multi-plane picture of my running mechanics. I knew there was something off-kilter, but I hadn’t been able to determine exactly what. Kathleen reviewed the videos and looked at my hips, my stride and my foot-strike, and was immediately able to determine where the imbalance was. My hips and my gluteus medius. The left hip was swinging every which way (hip instability), causing my right foot to cross over the midline, causing my left stride to be longer and less efficient than the right, causing a lovely domino effect. She then tested me for hip weakness, and BAM, there is was. I could not push against her with my left leg, nor did I have the flexiblity on that side that I had on my right side. My left glute was also weak. WHOA again! She worked on me and pulling my legs this way and that, readjusting my hips. Kathleen then showed me and had me practice three different exercises to do to make sure that I could continue getting my left hip, glute, and hamstring back into the game. YES! I am not doomed to the couch or the elliptical! The epiphany I have been searching for all year. YESSSSSSS! I knew there was something to the fact that whenever I looked at pictures of myself mid-stride, my left side always looked as if I had been leaning and crunching a little to the left. Now I know that I have not been imagining it, and that it’s not just some weird idiosyncrasy of my running. So, high-tech gait analysis and extremely competent running-focused physical therapy to fix imbalances that allow me to run forever instead of just now and tomorrow? I’ll take it. I’d like to be that ninety-year old blowing by you on the track, in a few decades, if you don’t mind.